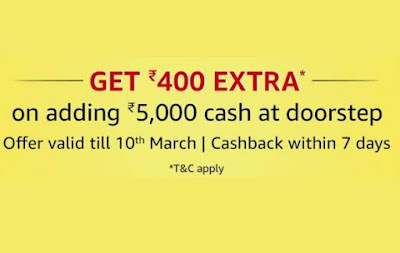 Amazon Doorstep Cashload Offer – Hi Guys, Amazon Super Value Days Are Going So Comes The Online Offers , Amazon is Back with Amazing Loot on Load Money. 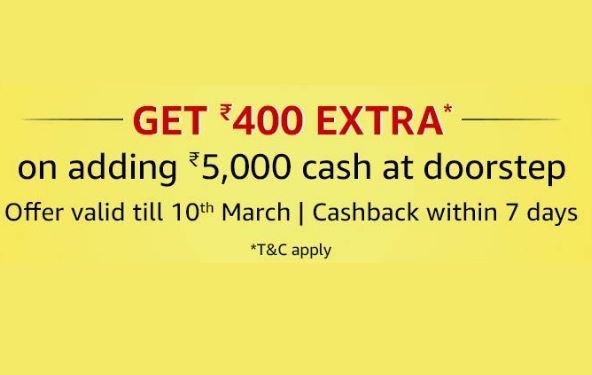 You can get Rs.400 Cashback on Load Money at Doorstep up to Rs.5000. That Means, Rs.400 Absolutely Free in Amazon Pay. This Offer is Live till 10th March So, There is too much time to avail this Offer. 1) This Doorstep Load Offer (“Offer”) is made available to you by Amazon Pay (India) Private Limited (“Amazon”). The Offer will be made available on the website www.amazon.in and the mobile site and mobile application thereof (collectively “Amazon.in”) by Amazon Seller Services Private Limited (“ASSPL”). 4) This Offer will commence on 00:00:00 on March 1, 2019 and continue till 23:59:00 on March 10, 2019 (both days inclusive) (“Offer Period”), unless extended or revoked by Amazon at its sole discretion, without prior notice and without any liability. 8) Under this Offer, an Eligible Customer shall be entitled to a maximum cashback of INR 400/- during the Offer Period.